Enrollment in the Ohio Digital Library is open to public libraries in Ohio serving populations of 100,000 and under. Provide patron authentication via the preferred methods of SIP, SIP2, NCIP or Patron API. (Libraries should check with their ILS vendors regarding available authentication protocols, as there may be a cost involved to implement patron authentication.) If your library does not use patron authentication, OverDrive offers an alternative program. Pledge to spend the required percentage of their annual collection budget on materials for the consortium. Agree that all digital materials will be added to the shared collection. There may be additional fees authentication setup that are the responsibility of the library. Agree that any books purchased for the Ohio Digital Library’s collection will remain in the collection in the event that a library leaves the consortium. Agree to volunteer staff to serve on task forces or committees to aid in the guidance of the Ohio Digital Library. Agree to follow all policies and guidelines put forth by the Ohio Digital Library and State Library of Ohio. Schedule C – Agreement between enrolling library and OverDrive, Inc.
Once the enrollment documents are submitted, there is a two month enrollment process. During this process your library will work with the State Library of Ohio and OverDrive to setup authentication for your patrons. There will also be training webinars held that are recommended for all staff members on how to use the service, how to order materials, and consortium policies and guidelines. This enrollment period is a time for your library and staff to learn how to use the system before it is available to your patrons. Attendance at all the training sessions is mandatory, so if you believe staff at your library will be too busy with other duties during this period please contact Anne Kennedy, Project Manager at the State Library before enrollment with any concerns. The cost of the Ohio Digital Library is 4.5 to 5 percent of a library’s annual collection budget in the purchase of materials for the shared collection. The library does not send the enrollment fee to the State Library or OverDrive. Instead, once a library is enrolled and launched, they can then purchase materials to add to the collection. The State Library will track each library’s spending to ensure they are meeting their minimum requirement. The State Library of Ohio provides downloadable audiobooks and ebooks through the Ohio Digital Library (ODL) in order to provide resources to ODL member libraries’ patrons that focus on life-long learning, including resources for leisure and recreational education. Resources are chosen to reflect a broad spectrum of viewpoints and reader interests. ODL adheres to the American Library Association Library Bill of Rights and the Freedom to Read Statement and considers all materials in the collection protected by the First Amendment of the United States Constitution. Due to technical and licensing limitations, ODL is unable to accept gifts of personally purchased ebooks or downloadable audiobooks. Donated money for specific ebooks or audiobooks may be accepted through an ODL member library, depending on that library’s policy. No conditions may be imposed relating to any gift either before or after its acceptance by an ODL member library with an understanding that donated materials are subject to the same selection, evaluation, and disposal criteria as material selected for purchase. The collection contains a wide variety of materials to meet the variety of needs of a diverse population. The State Library of Ohio neither approves nor disapproves of the views expressed in materials included in the collection. Anyone who wishes to have materials reconsidered for inclusion or removal from the ODL collection should contact their member library, who will give the patron a copy of this policy and review it with them. ODL member libraries have the right and obligation to respond to their patron’s inquiries, including material challenges. If a member library determines a digital item should be considered for removal from the ODL collection in response to a challenge, they should submit a request to the ODL Advisory Committee for reconsideration. The ODL Advisory Committee will review the request and make the final decision on the digital item. This collection development statement will be reviewed by the ODL Advisory Committee and State Library representatives at the start of each calendar year. Ohio Digital Library member libraries are encouraged to be knowledgeable about what is available and in demand in the Ohio Digital Library collection. Libraries should be aware of the Collection Development Statement developed by the State Library of Ohio and approved by the Ohio Digital Library Advisory Committee when purchasing material. These guidelines for collection development and ordering are in place to help the consortium build a dynamic collection that meets the needs of library users. As the number of libraries involved with selecting and ordering material increases, libraries need to be more aware of how the collection is compromised and used. Goal: Recommended maximum hold ratio on items is 12 items. Goal: Lower the average wait period on items. These guidelines are developed to help libraries meet the consortium’s collection development goals of building a dynamic collection that meets the needs of its users. Distributing spending throughout the year allows your library the flexibility to respond to demand and patron requests more easily. What is high circulating but there are only a few copies or titles in the collection? View the “Reports” section of this document for more information about reports in OverDrive Marketplace. Every library staff member purchasing digital material should be aware of publisher restrictions on the sale of digital media to libraries. Currently there are a number of publishers which refuse to provide either ebooks, audiobooks, or both formats to public libraries for loan to patrons. The reasons behind these restrictions vary from publisher to publisher. Below is a list of current publishers and their imprints who do not provide content to libraries. OverDrive has two tools, Smart Lists and Holds Manager, that allows libraries to easily fill holds or purchase new content based on the criteria you set through an automated process. The tool runs periodically as set by the library and creates a list of titles to be purchased. In order to facilitate reaching the consortium’s collection development goals, the State Library will manage an account called “Holds Manager.” Member libraries can contribute all, a portion, or none of their minimum contribution amount to the Holds Manager account. These funds will then be used to purchase titles with high holds, expiring metered access titles, or titles for the overall good of the consortium’s collection development. The materials purchased by the Holds Manager account are based on overall holds and hold ratios for the group, not for individual libraries. Many libraries have expressed concern about this but remember that your library patrons are using materials purchased by other libraries, and other libraries are using materials purchased by your library. Lowering the number of holds and increasing availability benefits everyone in the group. Libraries that are interested in contributing to the Holds Manager account will need to indicate interest on their current year’s MOU or contact the Project Manager, Anne Kennedy, akennedy@library.ohio.gov, throughout the year. Your library will be invoiced by OverDrive for the amount you indicate. The invoice will list “For content credit” for the description. All dollars contributed to the Holds Manager account will be attributed to your library’s overall annual Memorandum of Understanding (MOU) obligation. Libraries are not required to participate and contribute to Holds Manager but it is recommended. Member libraries have the option to sign up for an Advantage account for their library. Advantage accounts gives libraries that are members of a consortium the ability to offer titles for the benefit of their patrons. OverDrive Advantage members can purchase additional copies of popular titles that are already in the shared collection as well as titles that are not yet available. If your library purchases a title for your Advantage collection, you must purchase one for the consortium collection. Patrons browsing the consortium’s OverDrive-powered website will only see titles that are available to all members. In addition to the full consortium collection, Advantage members have a custom URL for their patrons that always displays the Advantage titles they have purchased. It is recommended that your library link to this custom URL on your website. Additionally, your library should encourage your patrons to always login with their library card before beginning to browse for titles so they can see the full range of titles available to them. OverDrive Advantage members receive a special login to their consortium’s current Marketplace account. A library’s Advantage collection will be integrated into the existing shared collection, but only patrons of individual OverDrive Advantage libraries can view and check out these titles. Loan periods and lending rules established by the consortium remain the same for OverDrive Advantage titles. For example, the Ohio Digital Library loan period for audiobooks is 21 days in the consortium therefore audiobooks in a library’s Advantage collection will also have a 21-day loan period. If a library decides to leave the consortium, the Advantage collection is transferable to a new OverDrive-powered website. 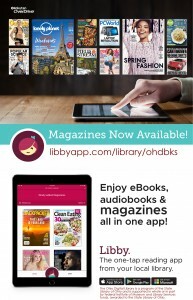 Libraries can order MARC records for their OverDrive Advantage titles. Libraries can track the success of their Advantage collection with Marketplace’s reports. Beginning January 1, 2018, Advantage libraries’ one copy/one user titles will be automatically shared with the consortium collection. The Advantage libraries will maintain ownership of these titles and will maintain priority on holds for their own users. The Advantage libraries will be able to choose which metered access titles will be shared with the consortium collection. It is recommended that older titles not in current high demand are shared with the consortium collection. Beginning January 1, 2018, 20% of the Advantage spending will be counted toward the library’s overall MOU obligation. Ohio Digital Library members have the right and obligation to respond to their patron’s inquiries including material challenges. If a member library wishes to have a digital item considered for removal from the Ohio Digital Library’s collection in response to a challenge, they should submit a request to the Advisory Committee for consideration. Selection decisions are based on the merit of the works as they relate to the goals of the Ohio Digital Library. Works are selected to meet the expressed and anticipated needs of the statewide community. These works are inclusive of statewide cultures and opinions, not just the opinions of a particular community. Ohio Digital Library members are located throughout Ohio and work to ensure a balanced and fair collection. Variety and balance of opinion is sought in all digital formats. Help Overdrive – on the Overdrive website for general help questions. Staff Training on the Overdrive website. Overdrive has a collection of print-ready materials, digital resources, and communication templates for libraries to download and use. Click here to visit their Marketing and Outreach page. Libby business cards customized with the Ohio Digital Library logo were distributed in late 2017. Member libraries request additional cards by contacting Anne Kennedy at akennedy@library.ohio.gov. Ohio Digital Library Magazines: Download PDFs with bookmarks that my be customized with name of library and a half-sheet flyer. 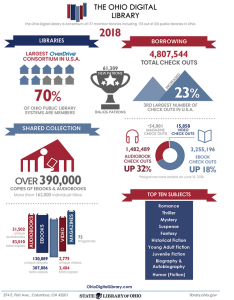 Click here to view 2018 Infographic of the Ohio Digital Library’s report of 2018 use, collections, and more.